British Airways owner IAG is looking into the possibility of expanding its A380 fleet beyond the 12 it already is operating or has ordered. BA received its first A380 in July 2013 (see the story about the delivery here) and currently has 10 (see story here) with the final two to be delivered this year. Destinations served by the aircraft include Singapore, Hong Kong, Johannesburg, Miami, San Francisco, Los Angeles and Washington DC. It configures the aircraft in four classes, with 14 seats in First on the main deck, followed by 44 Club World seats in a 2-4-2 configuration, then 199 World Traveller seats in a 3-4-3 layout. The upper deck has a further 53 Club World seats in a 2-3-2 layout, followed by 55 World Traveller Plus seats also configured 2-3-2, and then 104 World Traveller seats in a 2-4-2 layout. To see a seatplan, click here. 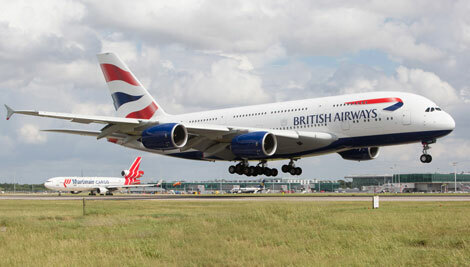 Now it seems that Chief Executive Willie Walsh is considering a further expansion of up to another six A380 aircraft. In comments made at the Airline Economics forum in Dublin, and reported on Bloomberg and Reuters, Walsh said that IAG was considering leasing the A380s since the price for buying them new was “too high”. This may be a negotiating tactic to lower the price of the A380s from Airbus, which has had difficulty securing new orders for the aircraft (see story here), although ANA reportedly placed an order for three earlier this money (story here). Nevertheless, Walsh will be aware that several airlines are looking to offload A380s, including Malaysia Airlines, which has stopped flying the aircraft to destinations such as Paris (see story here). At a slot-constrained airport, the A380 is useful for allowing an airline to carry more passengers per slot (Emirates has A380s on all five of its slots at London Heathrow). It also makes sense where there is high demand on a route, but the airline does not want to – or is unable to – add an extra frequency. Walsh also spoke of the possibility of having the A380 enter service with fellow airline Iberia. In addition reports from the Wall Street Journal, Willie Walsh said he also regretted not ordered more B777-300ERS (BA has six) and would be interested in increasing the fleet size, again by leasing.